In this game there are 5 eligible wives for you to marry. Each of them are around the same age and are all found in town. 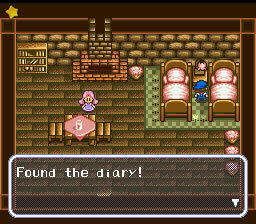 Win them over by raising their heart level listed inside their diaries, located in each one's house. Reach heart level 5 and you will have the option of marriage. Before you marry, remember that you need to upgrade your house to the Deluxe Log Cabin. Also to help aid the process of increasing the number of hearts there are a few things you can do. During the town Dances you can ask the girl to boogie with you. Don't forget to give her lots of gifts, and hang out with her during the Star Night Festival. The Blue Feather you'll need to propose marriage can be bought from the Peddler when he's in town. It will cost you 1000 G.
Personality: Ann can only be described as a Tom-Boy. She loves inventing new things. One of her inventions in the game is the Sprinkler. She is usually found working on something at the Tool Shop. Schedule: Monday through Friday she is found inside of the Tool Shop. On Saturday she stands out front of the shop, and on Sunday Ann can be found sleeping inside of the Church. During the Star Festival she is at the Spa. After marriage she will be working inside your Tool Shed. Personality: Ellen is an Animal lover and is usually found outside the Livestock Shop. She is the girl that gives you your dog on your first day. Schedule: From Monday to Saturday she waits outside in front of the Livestock Shop, and Sundays she is inside the Church. On the Star Festival she is waiting at the Town Square. Gifts: Cake, Eggs, Flowers, and Milk. No perfume, Mushrooms, or Poisonous Mushrooms. Personality: Eve has that wild and outgoing nature. She loves everything dealing with berries, wine, vineyards, etc. She lives and works at the Bar. Schedule: Monday through Friday at the Town Square, Saturday walking around the Mountain, and Sunday at the Spa. On the Star Festival Eve is inside the Bar. Gifts: Pink Perfume, Flowers, Summer season Fruits, Wild Grapes. Does not like Fish, Mushrooms, or Poisonous Mushrooms. Personality: Maria is one of those Goody Goody Church going girls. She is always talking about the "Higher Being" or something pertaining to Church. One of her talents is playing the Organ. Schedule: From Monday to Friday she is sweeping outside the steps of the Church. On the weekend she is inside the Church, as well as during the Star Festival. Gifts: Green Perfume and Flowers. She does not like Cakes, Poisonous Mushrooms, and Weeds. Personality: Nina is overly obsessed with plants and flowers. She loves the outdoors and loves to hang around the mountain area. Schedule: Monday through Friday, Nina is walking outside the Flower shop. On Saturday she is inside the Cave, and on Sunday she is at the top of the Mountain picking flowers. During the Star Festival she is at the top of the Mountain. Gifts: Give her Green Perfume, Cakes, and Flowers. Nina does not enjoy Herbs, Mushrooms, or Poisonous Mushrooms. After marriage don't associate with the other girls and be home by 6:00 pm every night.